John McGuinness (L) claims the meeting came before McCabe's appearance at the PAC. 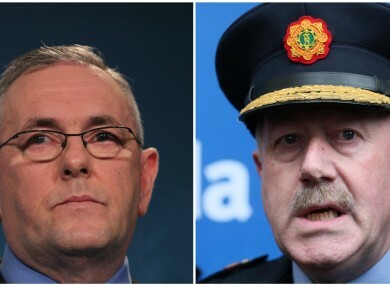 FORMER GARDA COMMISSIONER Martin Callinan met with then-Public Accounts Commission (PAC) chairman John McGuinness in a Bewley’s car park to talk about Maurice McCabe, the Fianna Fáil TD has claimed. The 20-30 minute meeting came ahead of Maurice McCabe’s appearance at the PAC with McGuinness saying that “vile and disturbing” stories about the garda whistleblower were relayed to him. Speaking to RTÉ’s This Week programme, McGuinness said that the meeting was at the request of Callinan who also chose the location of a Bewley’s car park on the Naas Road. McGuinness said that he believes the intention of the meeting was to raise doubts about the reliability of Sergeant McCabe. “It was outlined to me the various question marks over Maurice McCabe, and I questioned whether or not he should meet directly with Maurice McCabe and attempt to sort out all of the range of issues that were in the public domain,” McGuinness said. The intention I think of the meeting was to suggest that he had question marks over him, I didn’t accept that. McGuinness said that what he was told by Callinan about the whistleblower “wasn’t new” and that he had already spoken to McCabe about the claims. McGuinness ultimately decided that PAC would go ahead with its plan to hear evidence from the whistleblower. “There were never any documents produced at any level, or at any stage, that would indicate that the PAC should not take evidence from Maurice McCabe,” the TD says. McGuinness added that he did not tell McCabe about the meeting with the commissioner. “What was related to me were so vile and disturbing that I did not want to relate it to Sergeant McCabe, and I’d heard it before,” he said. McGuinness first spoke about his meeting with Callinan in a speech to the Dáil on Thursday in which he described efforts to “discredit” McCabe as “absolutely appalling”. “Every effort was made by those within the Garda Síochána at senior level to discredit Garda Maurice McCabe,” he told the house. The Garda Commissioner confided in me in a car park on the Naas Road that Garda McCabe was not to be trusted and there were serious issues about him. The vile stories that circulated about Garda McCabe, which were promoted by senior officers in the Garda Síochána were absolutely appalling. McGuinness says that he was not asked by Callinan to keep the meeting secret, adding that he has decided to speak about it now because of questions being raised about McCabe. The reason why I’m raising it now is because the finger is being pointed, I suppose, at Maurice McCabe. It has to be asked, who else within the Garda Síochána at that level knew at that time about the efforts that were being made. Email “PAC chairman reveals secret Bewley's car park meeting with Garda commissioner ”. Feedback on “PAC chairman reveals secret Bewley's car park meeting with Garda commissioner ”.